In its response to the question addressed by the German Bundestag, the government of the Federal Republic of Germany clearly stated its position over Nagorno-Karabakh region and seven surrounding districts, the Azerbaijani Foreign Ministry said in a message on Oct. 11. 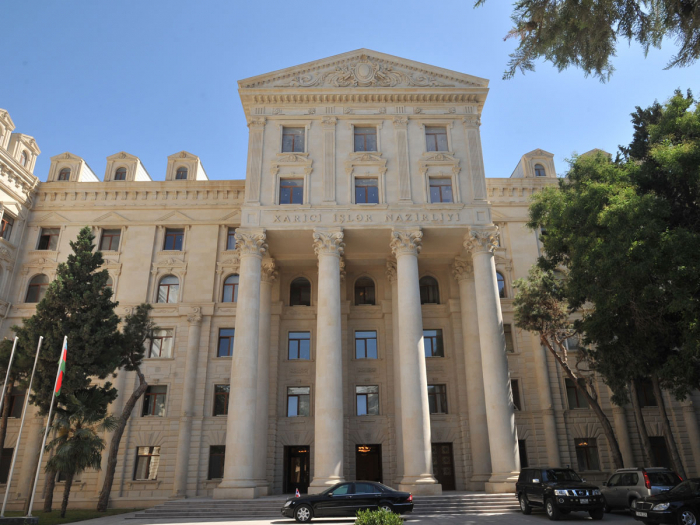 The Azerbaijani Foreign Ministry was commenting on the response of the Government of the Federal Republic of Germany to the question addressed by German Bundestag on the Germany-Armenia relations, as well as the position of US Deputy Assistant Secretary of State George Kent expressed at the press conference in Baku on the settlement of the Armenia-Azerbaijan Nagorno-Karabakh conflict. “The government of the Federal Republic of Germany considers Nagorno-Karabakh and seven surrounding districts, controlled by the armed forces of Armenia, as inalienable parts of Azerbaijan and it does not recognize the illegal regime created in the occupied Azerbaijani territories,” the message said. “German Chancellor Angela Merkel voiced the same position during her visit to Azerbaijan and underlined the support for the efforts towards the settlement of the Nagorno-Karabakh conflict based on the UN Security Council resolutions,” the ministry said. “During his visit to Baku, Kent reiterated the position of the State Department on the settlement of the conflict and stated that the US position is based on the four resolutions of the UN Security Council,” the ministry added. “Both of these statements are another vibrant evidence of international community’s support for the settlement of the conflict based on the norms and principles of international law, sovereignty and territorial integrity of Azerbaijan, as it was voiced by President of the Republic of Azerbaijan Ilham Aliyev in his speech at a recent meeting of the Cabinet of Ministers,” the ministry said. “This latest clear position of international community is a strong message to the Armenian leadership to return back to the peaceful talks on the conflict settlement, withdraw troops from the occupied Azerbaijani territories and launch substantive talks soon,” the ministry said. “The OSCE Minsk Group co-chairs stated numerous times that status quo is unacceptable and unsustainable,” the ministry added.